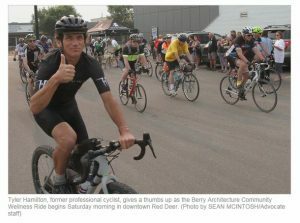 Dozens of cyclists were travelling around Central Alberta for the 10th annual Berry Architecture Community Wellness Ride Saturday. The event was in support of the Central Alberta Brain Injury Society and the Canadian Mental Health Association – Central Alberta Region. “In the last few years, the ride’s (popularity) has gone sky high,” said George Berry, Berry Architecture and Associates owner and race organizer. Having retired professional cyclists Tyler Hamilton and Alex Stieda participate in the ride has helped improve the event’s profile, said Berry. “They’re two of the best retired professional cyclists and having them here is bringing a lot of people out – it brings a lot of awareness to the cause and the event,” he said. Berry said the event’s main goal is to get the community talking about mental health and brain injuries. “I don’t shy away from telling anyone I busted my shoulder pretty bad almost two years ago and I’ve also been dealing with mental health issues. It’s not a negative thing for anyone to talk about,” he said. About 70 people participated in this year’s Wellness Ride. Christine Stewart, Canadian Mental Health Association – Central Alberta executive director, said the ride means a lot to the non-profit organization. “It’s amazing all these people are willing to come out to support us. “In the non-profit world there is a lot of struggle for funding, so to have the support of George and his whole team is amazing. Non-profits dream of having partners like this,” said Stewart. Stewart said the money raised for the association typically goes into the CMHA Mental Health and Wellness Education Program, which offers support groups and educational courses to identify when an individual’s mental wellness is not at the maximum level and how to improve it.